Mobilising your Health, Well-Being, Creativity and Silence . 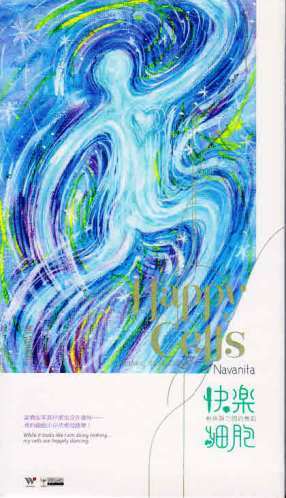 The Happy Cells Moving Meditation CD with Navanitas GuiDance is accompanied by 9 musicians who share their love,joy and meditation through the music . Deva Premal, Miten, Bahramji, Dhwani, Pushkar, Deuter, Praful, Shastro and Nadama. Plus a beautiful booklet with inspiring pictures and tips for an experiential body based GuiDance to support you being a friend with your body and its community of 50 to 100 trillion dancing cells . Listen, Move, Trust Whatever we do on a physical level affects our body, mind, heart and soul. Scientific proof is that when you are happy your cells secrete a potency that strengthens your health, well-being and creativity. Spiritually, cells are a place of spaciousness and conscious connection with our essence, being, love. Perception of the spaciousness within becomes tangable through bringing awareness into the body and its dancing life source. Through practicing this meditation you can rediscover your body in an innocent and kind way. Moving deeper into the body, you move deeper into silence on a cellular level. Even though it looks like I am doing nothing, my cells are happily dancing. 1. Delight in your moving body: Rekindle the joy to move. Explore and expand a language of movement which supports your expression, creativity, sensuality and perception. How your body moves affects how you move in life. 2. Inspiration: The CD is a map. The essential is your own actual experience. 3. Meditate: Discover how easy it is to meditate.You can choose to play with the whole moving meditation, one track at a time or a combination of tracks and discover how easy it is to meditate. 4. Educate :Re-educate your self to be able to connect, listen, trust and take care of your own body. Being connected to the body in a playful and deep way empowers your ability to ground, self regulate, centre, balance. BY MOVING DEEP INTO OUR CELLULAR CONSCIOUSNESS WE TRULY RECONNECT WITH POTENCY AND FILL UP FROM THE LIFE SOURCE. FROM HERE WE MOVE WITH THE SUPPORT AND POWER OF OUR CELLS. AS WE PRACTICE WE ARE ABLE TO CONNECT ANY MOMENT WITH THEM AND MOBILISE THEIR FEEL GOOD AND HAPPY ESSENCE ........this is love .